In the latest upgrade to its facilities and guest experiences, Four Seasons Resort Bali at Jimbaran Bay has reopened its main restaurant, Taman Wantilan, offering a new live cooking concept by a brigade of specialty chefs. The restaurant’s ambience and decor have been reimagined while maintaining the connection to Jimbaran Bay and character of the resort’s iconic village-style architecture. Named after the traditional “gathering place” at the heart of every Balinese village, Taman Wantilan emerges from an extensive renovation with chic residential-style interiors, an ocean-view terrace for all-day lounging and tiki cocktails, two large show kitchens in the centre of the dining room, and a custom-designed, temperature-controlled Dessert Room. Guests can enjoy the sparkling ocean views and dusky sunsets from every vantage point, while taking their time to indulge in the culinary journey of Asian and Western cuisines. The new concept celebrates the craftsmanship and international experience of the resort’s culinary team, led by Executive Chef Pasquo Bowman King. At the Asian station, Chef Wayan Siana shares his passion for Balinese cuisine as well as regional fare from Malaysia to Thailand. Create your own noodles; hit the sashimi and seafood bar; savour succulent seafood teppanyaki sourced from the famous Jimbaran Fish Market, and don’t miss Wayan’s Singaporean chili crab. Let Indian Specialty Chef Anil Naudiyal heat up your taste buds with authentic dishes from the charcoal tandoor, kebabs, home-style curries, dahl and fresh-made naan. Create your favourite pasta, visit the carvery for slow-roasted macadamia-crusted prime ribeye and lamb rack, or go light at the wellness station with “shaker salads”. In the Dessert Room, award-winning Executive Pastry Chef Yusuke Aoki (just awarded Asia’s Best Chef in the Valrhona C3 Competition 2018) marries local flavours with refined French technique to present a myriad of Petit Gateaux, home-made gelato bar with dozens of toppings and fresh-made crepes. 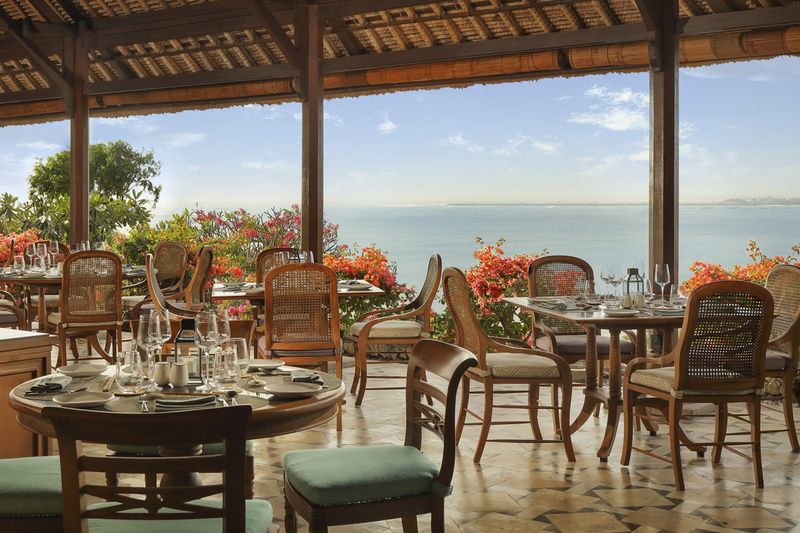 “The refurbishment also presents a fresh, sophisticated new look with the modern show kitchens complementing the traditional thatch-roof architecture of the restaurant,” said Uday Rao, General Manager of Four Seasons Jimbaran Bay. Taman Wantilan serves international buffet breakfast daily 6.30-11am and dinner 6-10pm. It expands the resort’s culinary offerings which also include the renowned Sundara Beach-Club and Restaurant for Modern Asian ‘Customized Dining’ and innovative cocktails; Jala for authentic Balinese cuisine in a home-style setting; and Pool Terrace Café for Western and Asian favourites.